OK, so I have to admit I’ve been slacking off. It’s been rainy, and there’s been a lot going on so blogging hasn’t exactly been on the top of my to-do list. However, I feel that it is important to share this little tidbit about future goals for our boy. First let me start by pointing out that poor Fiz is the guinea pig for our AOT adventure. He is the first horse we have owned under the Twisted Sisters title and all the trial and error type things get to happen with him. He is perfect for this job as he is at times, each of the things we need. Patient, kind, funny, quirky, challenging, willing, understanding, confusing, and a whole lot more all wrapped into one horse! For that and many other reasons, he is the most special horse to us and we could never, and would never think of replacing him. He’s got a home with us for life. It goes without saying that this horse means more to us than we could ever begin to describe. Shaping his future is extremely important to us, because he has a very important job to do in the not so distant future. We haven’t put this word out there on this site yet, but on January 5, 2015, Cindy and her husband welcomed a beautiful baby girl named Madelyn into their family. 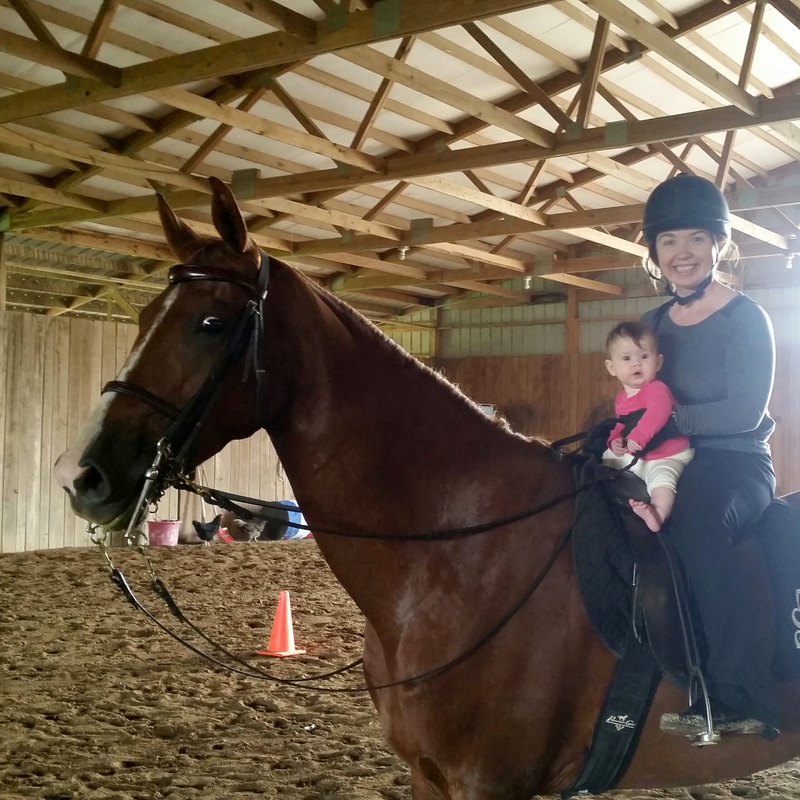 And as long as she wants it to, Fiz’s future includes teaching her all about what it’s like to be a horsewoman like me and her momma! His future is to teach her discipline, dedication, strength, focus, goals, and any other quality that you can name when it comes to the skills necessary to successfully ride a horse. Furthermore, if she chooses to compete in the world of equine competition, his job includes making sure she has a safe mount in both the practice and show rings, and anywhere else he might take her. His future includes being her saint on 4 hooves. It includes being her trusty steed who will understand that he should be forgiving, yet teach her what is correct and incorrect when in the saddle. His future includes helping a little girl grow up understanding that dreams can come true, as long as you work hard for them. Ok, maybe that last part holds true not only for sweet Madelyn, but also for me. Fiz doesn’t know it yet, and Madelyn is too young to understand, but we have some pretty huge aspirations for these two, if they so choose to take that path. 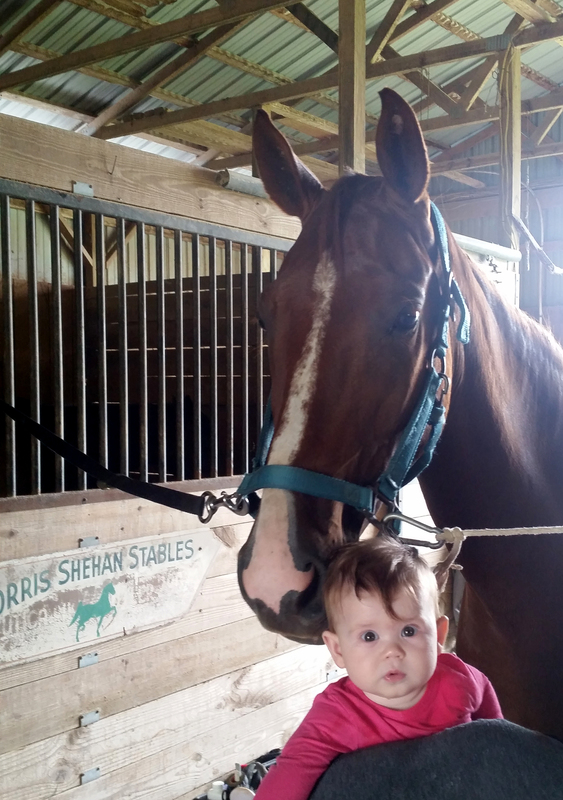 I look forward to seeing these two together, and hope that Madelyn can share in our passion for horses. It will be fun having a little girl to guide and coach and see the progress and accomplishments they make together.